How do You Keep Your Pantry Dry to Prevent Your Food from Spoiling? Whether you’re storing food to save money, prepare for a major disaster or simply enjoy the art of food preservation, avoiding food spoilage is always a challenge. In many situations, the best way to make food as long as possible is to keep it dry. But what are some ways to keep your pantry or other food storage location from getting wet? If you’ve properly prepared your food for storage, any excess moisture that might spoil your food will come from sources other than the food itself. To effectively combat any extra moisture in your pantry, you’ll need to figure out where it’s coming from. Most pantries will be located at or below ground level. This means the source of water will probably stem from outside your dwelling, such as ground or surface water flowing during precipitation or another natural occurrence. But this may not always be the case. There might also be moisture in the air in the form of humidity. Therefore, before you take any steps to keep your pantry dry, you’ll need to figure out where your water is coming from. You can do this by taping a roughly 1’ x 1’ sheet of aluminum foil onto the wall of your pantry. After waiting a few days, partially peel away the aluminum foil. Examine both sides of the sheet of aluminum foil for any signs of moisture buildup or condensation. If you see water on the inside of your aluminum foil your water is coming from an outside source, such as groundwater. If your aluminum foil has moisture on the side facing the pantry interior, then the water infiltration in your pantry is mostly coming from the air itself. Now that you know where the moisture is coming from, you can more effectively take steps to prevent water in your pantry. If you have water creeping in through your floors or walls, there are a few things you can do to prevent this unwanted moisture. But depending on the exact amount and source of the water you’ll need to anticipate spending a lot of time and/or money to remedy the situation. 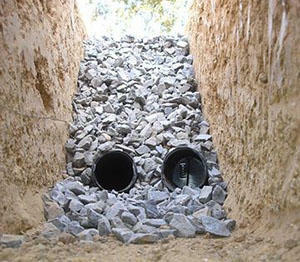 First, you can implement a storm, ground or rainwater management system. This can include anything from installing new gutters, placing downspout extensions to divert roof water away from the building, placing French drains in your yard, re-grading the ground around your building, installing a sump pump drainage system or drilling a dry well. The exact water management system will depend on the building in which your pantry is located, the exterior layout of your land and the source of the unwanted water. Second, you can seal your concrete floors and walls. You can do this with a special paint that will fill in the tiny holes in the concrete. There are many different types of sealants available and they come in a variety of colors. Some are designed for particular situations and surfaces, so you’ll need to do a little bit of research to find the best sealant paint for your situation and preferences. Third, you can plug up any openings (such as a crack) in the pantry walls or floor. This won’t completely stop exterior water infiltration, but it will slow its flow. Fourth, you can relocate your pantry. For example, if your pantry is located in the basement and you’re dealing with groundwater, placing the pantry on the first or second floor will avoid the groundwater altogether. You will no longer have a constant, cool temperature to help store your food, but it might be worth it if you have an uncontrollable water problem in your pantry. If your unwanted moisture comes from the air itself, your task for stopping the water should be a little bit easier than if it comes from an outside source. First, you can insulate any cold surfaces. This includes wall surfaces, appliances and cold water piping. Just like how a cold drink will “sweat” (have condensation form on the outside) when placed in a warm and humid environment, these cold surfaces will pull out the moisture from the air and allow it to collect on the cold surface. Second, seal any air leaks around your pantry. If the humid air comes from the outside or another room, blocking that airflow can make a significant dent in the humidity in your pantry. Third, install a good exhaust ventilation system. An effective exhaust system can remove humid air from the pantry’s interior and send it outside where the moisture isn’t a problem. Regardless of where the water is coming from, there are a few universal strategies that you can use. The first is placing a dehumidifier in the pantry. You can purchase a good quality one for under $200. You’ll just need to regularly empty the water collection bucket, or install a plumbing system to take the water from the dehumidifier to the nearest drain. If the pantry doesn’t have an electrical outlet, or can’t otherwise support a dehumidifier, a second thing you can try is a moisture-attracting product to pull moisture from the air and collect it in a container, such as a bag. One such moisture absorber product is DampRid. The most effective way to keep your pantry dry is to use several of the above approaches. This is especially true if there is exterior water entering your pantry. For example, even the best crack plugging and concrete sealing strategy can only stop so much water and only for so long. In the end, you’ll need to address the source of the water. And a dehumidifier that can keep unwanted humidity in check needs electricity to run. Should you lose power, even if you have an elaborate backup battery or power generation system, you may not want to use your precious electrical resources for powering a dehumidifier. Obviously the best strategy is to build “it” right the first time or from the start. I like that you logically look for the simplest solutions and make sure the room is sealed (air and water tight) and there are no cracks or irregularities. The non-power solution means less equipment and zero reliance on electricity. 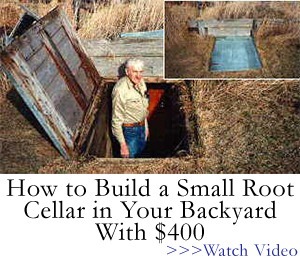 I think that is one of the biggest benefits and advantages of a cold room or root cellar. Otherwise one might as well just forget all this and buy a refrigerator or a freezer. We have a pantry/laundry room in my house, but I wish we had separate spaces and a dedicated pantry to keep food cool and dry. Nothing goes bad in there, but the room warms up with the moist air that comes from the dryer even with a vent. And then it feels humid gets uncomfortably warm. Use Calcium Chloride in plastic garden trays. CaCl2 is a desiccant. $20 / 50lb Home Depot. When Winter comes you can boil the collected water out, or you can use it as a safe sidewalk deicer! That’s a very good idea. Calcium chloride has a lot of uses for prepping – you can use it to make activated charcoal, for example – and it doesn’t cost a lot. A couple of sacks of it is a great addition to your stores. A question for you, Claude, …when will part 2 of Left Coast Chuck’s post regarding bicycles as a bug out vehicle be posted? That was a very interesting piece, and I’ve been waiting for the followup. I’m hoping I don’t have to wait too much longer. Hi, Hoosier! Chuck has sent me Part 2 and I’ll be posting it in the next few days. There will be at least one more part to follow that. I’m pleased you found it useful. Chuck is certainly an expert on bicycles, and I think his knowledge will be very useful for anyone that’s thinking of using one for their bug-out. I’m always aware that Chuck has had to bug out for real, so he knows what he’s talking about. Part 3 too?!? This just keeps gettin’ better! Bicycles have such usefulness, and the more I can learn, the better off I will be, and so will all the readers. A dehumidifier will provide you with clean drinking water taken from the air. Instead of a root cellar, build an earthbag dome and berm dirt around it. A friend lives in a geodesic dome and uses calcium chloride,in a tilted metal bowl, with a fan blowing on it and it drains into a 5 gal. bucket. When the calcium chloride is all melted, he pours it into the metal bowl and boils it down until it’s solid again. It’s a cheap dehumidifier. Different things require different storage environments. Take the photo on the right at the top of the article. Mixing caned foods with potatoes is silly. Potatoes require a higher humidity, low temperature storage….a root cellar. Canned goods need a low humidity, low temp storage (unless you want the metal to rust)….so a well insulated, dry pantry. We have both. Apples (with ventilation, or the ethylene gas will cause your potatoes to sprout like crazy), potatoes, sand bin for carrots, stoneware crocks for kraut & waterglass egg storage, or anything in non metal containers go in our root cellar. Dry storage are cabinets in well insulated garage, or dry pantry I built on the north side of the house, partial underground, well insulated .